A monument to archangel Michael, the patron of Kiev, with Independence Square in the background. 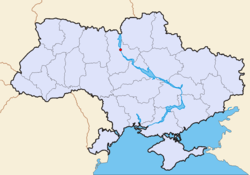 Map of Ukraine with Kiev highlighted. Kiev, also Kyiv ( Ukrainian: Київ , Kyyiv, IPA: [ˈkɪjiw]; Russian: Ки́ев , Kiyev; see also Cities' alternative names) is the capital and the largest city of Ukraine, located in the north central part of the country on the Dnieper river. Since 2001, Kiev has officially had 2,660,401 inhabitants, though this figure has likely grown to more than 3.5 million since then. Administratively, Kiev is a national-level subordinated municipality, independent from surrounding Kiev Oblast. Kiev is an important industrial, scientific, educational and cultural centre of Eastern Europe. It is home to many high-tech industries, higher education institutions, world-famous historical landmarks. 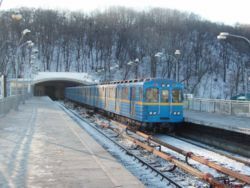 The city has an extensive infrastructure and highly developed system of public transport, including a Kiev Metro system. The name of Kiev comes from the name of Kyi, one of four legendary founders of the city (brothers Kyi, Shchek, Khoryv and sister Lybid). During its history, Kiev, one of the oldest cities in Eastern Europe, passed through several stages of great prominence and relative obscurity. The city is believed to have been founded in the 5th century as a trading post in the land of Early East Slavs. It gradually acquired eminence as the centre of the East Slavic civilization, becoming in the tenth to twelfth centuries a political and cultural capital of Rus', a medieval East Slavic state. Completely destroyed during the Mongol invasion in 1240, the city lost most of its influence for the centuries to come. It was a provincial capital of marginal importance in the outskirts of the territories controlled by its powerful neighbors: first the Grand Duchy of Lithuania, followed by the Polish-Lithuanian Commonwealth and, finally, Russia. The city prospered again during the Russian industrial revolution in the late 19th century. After the turbulent period following the Russian Revolution of 1917, from 1921 onwards Kiev was an important city of the Ukrainian Soviet Socialist Republic, and, since 1934, its capital. During World War II, the city again suffered significant damage, but quickly recovered in the post-war years becoming the third most important city of the Union of Soviet Socialist Republics. Kiev remains the capital of Ukraine, independent since 1991 following the collapse of the Soviet Union. Kiev is located on both sides of the Dnieper River, which flows south through the city towards the Black Sea. Its geographic coordinates are 50°27′00″N, 30°31′24″E. Geographically, Kiev belongs to the Polesia ecological zone (a part of the European mixed woods). However, the city's unique landscape distinguishes it from the surrounding region. The older right-bank (western) part of Kiev is represented by numerous woody hills, ravines and small rivers (now lost mostly due to urbanization). It is a part of the larger Prydniprovska (near-Dnieper) upland adjoining the western bank of the Dnieper. 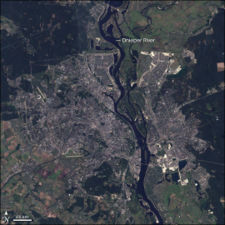 The city expanded to the Dnieper's left-bank (to the east) only in the 20th century. Significant areas of the Dnieper valley were artificially sand-deposited, and are protected by dams. The Dnieper River forms a branching system of tributaries, isles, and harbors within the city limits. The city is adjoined by the mouth of the Desna River and the Kiev Reservoir in the north, and the Kaniv Reservoir in the south. Both the Dnieper and Desna rivers are navigable at Kiev, although regulated by the reservoir shipping locks and limited by winter freeze-over. Kiev has a continental humid climate, although it has changed significantly during recent decades due to global climate changes. The warmest months are June, July, and August, with mean temperatures of 13.8 to 24.8°C (56.9 to 76.7°F). The coldest are December, January, and February, with mean temperatures of −4.6 to -1.1°C (23.7 to 30.0°F). The highest ever temperature recorded in the city was 39.4°C (103.0°F) on 31 July 1936. The coldest temperature ever recorded in the city was -32.2°C (-26.0°F) on 7 & 9 February 1929. Snow cover usually lies from mid-November to the end of March, with the frost-free period lasting 180 days on average, but surpassing 200 days in recent years. Kiev is one of the oldest and most important cities of Eastern Europe with an immense role in the development of the medieval East Slavic civilization as well as in the modern Ukrainian nation. Many historical and architectural landmarks are preserved or reconstructed in the city, which is thought to have existed as early as the fifth century. With the exact time of city foundation being hard to determine, May 1982 was chosen to celebrate the city's 1,500th anniversary. During the eighth and ninth centuries, Kiev was an outpost of the Khazar empire. Starting from some point during the late ninth or early tenth century, Kiev was ruled by the Varangian nobility and became the nucleus of the Rus' polity, which became known as Kievan Rus' during the Golden age of Kiev. In 1240 Kiev was completely destroyed by the Mongol hordes of Batu Khan, an event that had a profound effect on the future of the city and the East Slavic civilization. At the time of the Mongol destruction, Kiev was reputed as one of the largest cities in the world, with a population exceeding one-hundred thousand. From 1362, the area, with a largely diminished city, became part of the Grand Duchy of Lithuania and from 1569 a part of Polish-Lithuanian Commonwealth, as a capital of Kijów Voivodeship, transferred by then to the Polish Crown. In the 17th century, was transferred under rule of Muscovite Russia (later Russian Empire), where for some time it remained a provincial town of marginal importance. Kiev prospered again during the industrial revolution in the late nineteenth century when it became the third most important city of the Russian Empire, the major centre of commerce of the Empire's southwest. In the turbulent period following the 1917 Russian Revolution, Kiev became the capital of several short-lived Ukrainian states and was caught in the middle of several conflicts: the Great War, the Russian Civil War, and the Polish-Soviet War. From 1921 the city was part of the Soviet Union, and since 1934, the capital of Soviet Ukraine. In 1932-33 the city was affected by the devastating man-made famine known as Holodomor. While there was no famine for those who had jobs and ration cards, thousands of peasants from the rural areas were banned from the state food stores and were often dying on the streets. In World War II, the city again suffered significant damage, but quickly recovered in the post-war years, becoming the third most important city of the Soviet Union. It remains the capital of Ukraine, after the country's attainment of independence in the wake of the collapse of the Soviet Union. The ten Formal raions of Kiev. The Kiev City Council ( Ukrainian: Київрада; translit. Kyivrada) is the highest representative body of the city community. The members of city council are directly elected by Kiev's citizens, known as Kievans, and the council is chaired by the Mayor of Kiev. Administratively, the city is divided into " raions" ("districts"), which have their local governments with jurisdiction over a limited scope of affairs. Presently, there are 10 raions. For details on administration, see Legal status and local government of Kiev. Besides these, Kiev is informally divided into informal, historical neighborhoods, each housing from about 5,000 to 100,000 inhabitants. The natural first level of subdivision of the city is into the Right Bank and the Left Bank of the Dnieper. The Right Bank, located on the west side of the river, contains the older portions of the city. As of the All-Ukrainian Census conducted in 2001, the population of Kiev is 2,611,000. Please consult the table to the right for Kiev's historical populations. According to the census, the number of men accounted for 1,219,000 thousand persons, or 46.7%, and that of women – 1,393,000 thousand persons, or 53.3%. Since the 1989 census, the children population has decreased, and the population of persons at the older than able-to-work age has increased significantly. According to the census data, more than 130 nationalities and ethnic groups reside within the territory of Kiev. Ukrainians constitute the largest ethnic group in Kiev, and they account for 2,110,800 people, or 82.2% of the population. The ethnic makeup of Kiev's residents, excluding the Ukrainian population is characterized by the following data: Russians - 337,300 (13.1%), Jews - 17,900 (0.7%), Belarusians - 16,500 (0.6%), Poles - 6,900 (0.3%), Armenians - 4,900 (0.2%), Azerbaijanis - 2,600 (0.1%), Tatars - 2,500 (0.1%), Georgians - 2,400 (0.1%), Moldovans - 1,900 (0.1%). The language structure of Kiev is characterized by the following data: the part of those whose native language is Ukrainian totals 92.3% of the population, up from 88.4% in 1989. The percentage of those whose native language is Russian, totals 7.2% of the population. The number of people with higher and complete secondary education accounts for 1,069,700 people, up significantly by 21.7% since 1989. 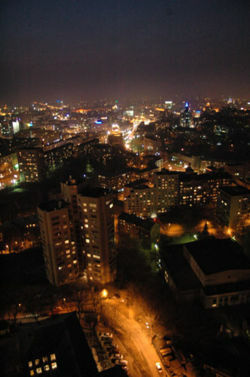 Bird's-eye view of the Kiev centre at night. View of the October Palace from the Instytutska street. Modern Kiev is a mix of the old and the new, seen in everything from the architecture to the stores and to the people themselves. Experiencing fast population growth between the 1970s and the mid- '90s, the city has continued its consistent growth after the turn of the millennium. As a result, Kiev's "downtown" is a dotted picture of new, modern buildings (known as novostroikas) amongst the pale yellows, blues and grays of the older apartments. Urban sprawl has been gradually reducing, while population densities of suburbs started increasing. The most expensive properties are located in the Pechersk, and Khreschatyk area. It is also popular to own a novostroika in Kharkivskyi Raion, Troyeshchyna, or Obolon along the Dnieper, as well as in some other better-established areas. With the Ukrainian independence on the turn of the millennium, other changes came. Western-style novostroikas, hip nightclubs, classy restaurants and prestigious hotels opened in the centre. Music from Europe and North America started rising on Ukrainian music charts. And most importantly, with the easing of the visa rules in 2005, Ukraine is positioning itself as a prime tourist attraction, with Kiev, among the other large cities, looking to profit from the new opportunities. The centre of Kiev has been cleaned up and buildings have been restored and redecorated, especially the Khreschatyk street and the Independence Square. Many historic areas of Kiev, such as Andriyivskyy Descent, have become popular street vendor locations, where one can find traditional Ukrainian art, religious items, books, game sets (most commonly chess) as well as jewelry for sale. An important part of Kiev's culture is the many theatres in the city, which include: Kiev Opera House, Ivan Franko National Drama Theatre, Lesya Ukrainka National Academic Theatre of the Russian Drama, October Palace, National Philharmonic of Ukraine, and others. Other cultural items include the: Olexandr Dovzhenko Film Studios, and the Kiev Circus. The most important of the city's many museums are the Kiev State Historical Museum, the WWII museum, the Kiev State Museum of Ukrainian Art, and the Kiev State Museum of Russian Art. In 2005 Kiev hosted the 50th annual Eurovision Song Contest. Football (soccer) is probably the most popular spectator sport among the young in Kiev, followed by ice hockey. Kiev has many professional and amateur soccer clubs, including the Dynamo and Arsenal clubs, which both play in the top division. 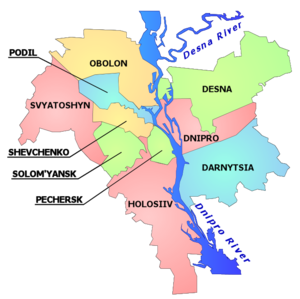 Other less prominent sport clubs in the city include: the Obolon soccer club and the Sokil hockey club. During the 1980 Summer Olympics held in the Soviet Union, Kiev held the preliminary matches and the quarter-finals of the football tournament at its Olympic Stadium, reconstructed for the event. The stadium is the largest of Ukrainian stadiums, as well as among Kiev's 15 stadiums/sport complexes. Initially constructed for audience of 100,000, following the installation of individual seats it can now accommodate 83,053 spectators. Other notable sport stadiums/sport complexes in Kiev include the Lobanovsky Dynamo Stadium, the Palace of Sports, among many others. Kiev does not only host field games and indoor sports, but also aquatic sports, which take place on the Kiev Reservoir at Vyshhorod, and on Trukhaniv Island in the Dnieper river, opposite the city centre, where there are many fine beaches and recreational facilities. In addition to that, cross country bicycling is another favorite sport, also taking place on the Trukhaniv Island. Kiev is also a great place for the food lovers, and not only those who have been fond of Ukrainian cuisine. An increasing number of international travellers, as well as the interest with which the Ukrainian city dwellers approach, have spurred a steady growth of bars and diners ranging from Japanese sushi-bars to traditional Italian and Spanish restaurants. While there is about as much contrast between these in terms of quality of food served as there is between the social classes in Ukraine, the majority of eateries tend to be overpriced, however featuring polite and thorough services. Probably, Kiev most famous historical architecture complexes are St. Sophia Cathedral and Kiev Pechersk Lavra (Monastery of the Caves), which are UNESCO World Heritage Sites. Noteworthy historical architectural landmarks also include the Mariyinsky Palace (designed and constructed from 1745 to 1752, then reconstructed in 1870), several Orthodox churches such as St. Michael's Cathedral, St. Andrew's, St. Vladimir's, the reconstructed Golden Gate, and others. The cylindrical Salut hotel, located across from Glory Square and an eternal flame at the World War Two memorial Tomb of the Unknown Soldier, the giant highly visible from the Dnieper hills Mother Motherland statue standing in the WWII museum are one of Kiev's well recognized modern landmarks. Among Kiev's best-known monuments are Mikeshin's statue of Bohdan Khmelnytsky astride his horse located near St. Sophia Cathedral, the venerated Vladimir the Great (St. Vladimir), the baptizer of Rus', overlooking the river above Podil, the monument to Kyi, Schek and Khoriv and Lybid, the legendary founders of the city located at the Dnieper embankment. Finally, two elevated on the tall columns modern monuments to the city protectors are located at the Independence Square in the city centre: the historic protector of Kiev Michael Archangel and a modern invention, the goddess-protector Beregynia. The St. Michael's Golden-Domed Cathedral, 1998 reconstruction. The Holy Dormition Cathedral of the Kiev Pechersk Lavra, post-1991 reconstruction. The Zoloti Vorota, 1982 reconstruction. The Verkhovna Rada building, the Ukrainian parliament. The National Opera of Ukraine. The National Bank of Ukraine.
" The House With Chimaeras"
Public transportation in Kiev includes metro (subway), buses, trolleys, and trams. The publicly owned and operated Kiev Metro system is the fastest, the most convenient and affordable network that covers most, but not all, of the city. The metro is regularly expanding towards the city limits to cover the growing demand, while the other kinds of public transport are not that well maintained. In particular, the public bus service fails to maintain its schedule. Public electric trolley bus and tram lines are more reliable, but are also technically obsolete and underfunded. The historic tram system, which once were a maintained and densely-developed method of transport, are now gradually being phased out in favour of buses and trolleys. One unusual mode of public transportation Kiev has is a funicular, that climbs on the steep right bank of the Dnieper River. It provides transport to 10,000-15,000 passengers daily. All public road transport in Kiev is operated by the united Kyivpastrans municipal company. It is heavily subsidized by the city as large groups of passengers (pensioners, etc.) are granted free service on its lines. 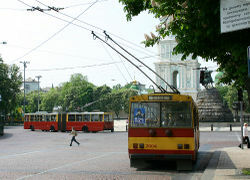 Trolley buses in front of the St. Sophia Cathedral. A simple distance-regardless tariffs system exists in Kiev public transport: the tickets for ground transportation are bought for each entrance into the vehicle. Discount passes are available for scholars and students. Pensioners use public transportation free. Monthly passes, which are sold at the price of 60 rides, are also available in all combinations of public transportation: metro, bus, trolley, tram. Recently, privately owned minibuses, marshrutkas, occupied Kiev's streets. They provide good coverage of smaller residential streets and have routes that are convenient for the residents. Minibuses take fewer passengers, run faster, stop on demand and are more available, although with an increased frequency of accidents. Ticket price and itinerary of private minibuses are regulated by city government, and the cost of one ride, while higher than on public buses, is still far lower than the Western European standard. The taxi market in Kiev is intensive but not adequately regulated. In particular, the taxi fare per kilometer is not regulated. There is a strong competition between private taxi companies. Many allow to schedule a pick-up by phone. Also, it is quite common for a local with a car (or even people from other parts of Ukraine) to provide taxi service unofficially. Traffic jams and lack of parking space are the growing problems for taxi service in Kiev. Current regulations allow for parking on pavements, which pedestrians may find inconvenient. Suburban transportation is provided by buses and short-range trains ( elektrichkas). There are a few bus stations inside the city providing suburban transportations. Private minibuses (marshrutkas) provide faster and more frequent suburban service, currently winning the competition against large buses. Elektrichkas are serviced by the publicly owned Ukrzaliznytsia company. The suburban train service is fast, most reliable and unbeatingly safe in terms of traffic accidents. But the elektrichka cars are poorly maintained and are overcrowded in rush hours. More than a dozen of elektrichka stops are located inside the city allowing residents of different neighborhoods to use suburban trains. Once existing suburban riverboats service is now extinct due to lack of profitability, limiting Kiev's water transport for cargo and tourism uses. Railways are Kiev’s main kind of outer transport connection. The city has a developed railroad infrastructure including a long-distance passenger station, 6 cargo stations, depots, and repairing facilities. However, this system still fails to meet the demand for passenger service. Particularly, the Kiev Passenger Railway Station is city's only long-distance passenger terminal (vokzal). There is construction underway for a new Darnytsia Railway Station on the left-bank part of Kiev, which may easer the tension of the central station. Bridges over the Dnieper River are another problem restricting the development of city’s railway system. Presently, only one rail bridge out of two is available for intense train traffic. A new combined rail-auto bridge is under construction, as a part of Darnytsia project. Passenger airlink to Kiev can be made through two of its airports: the Boryspil Airport, which is served by the most major international airlines from all parts of the world, and a smaller Zhulyany Airport, serving mostly domestic flights, and few flights to nearby countries. There is also a cargo airport in Kiev's north-western suburb of Hostomel. The international passenger terminal at Boryspil is quite small, yet modern. There is a separate terminal for domestic flights within walking distance. 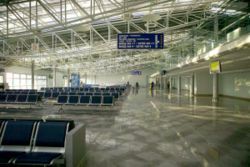 Passengers traveling to other cities within Ukraine by air usually stop for a connection at Boryspil, as the other airports in Ukraine such as in Donetsk, Simferopol, Odessa, provide very limited international connections. Kiev is one of the centers of world aviation industry, being a home for Antonov aircraft manufacturing company. Currently, there are expansion plans for the city's international airport, with construction to begin within the coming years. It is said that one can walk from one end of Kiev to the other in the summertime without leaving the shade of its many trees. Most characteristic are the horse-chestnuts ( Ukrainian: каштани; kashtany). Kiev is known as a green city, with two botanical gardens and numerous large and small parks. Notable among these are the World War II Museum, which offers both indoor and outdoor displays of military history and equipment surrounded by verdant hills overlooking the Dnieper river; the Hidropark: an island on the river and accessible by metro or by car, which includes an amusement park, swimming beaches, and boat rentals; and the Victory Park (Park Pobedy), a popular destination for strollers, joggers, and cyclists. Boating, fishing, and water sports are popular pastimes in Kiev. Since the lakes and rivers freeze over in the winter, ice fishermen are frequently seen, as are children with their ice skates. However, the peak of summer is when masses of people can be seen on the shores, swimming or sunbathing, with daytime high temperatures sometimes reaching 30 to 34 °C. The centre of Kiev (Independence Square and Khreschatyk Street) becomes a large outdoor party place at night during summer months, with thousands of people having a good time in nearby restaurants, clubs and outdoor cafes. The central streets are closed for auto traffic on weekends. Wide varieties of farming products are available in many of Kiev's farmer markets with the Besarabsky Market located in the very centre of the city being the most famous one. Each residential region has its own market, or rynok. Here one will find table after table of individuals hawking everything imaginable: vegetables, fresh and smoked meats, fish, cheese, honey, dairy products such as milk and home-made smetana (sour cream), caviar, cut flowers, housewares, tools and hardware, and clothing. Each of the markets has its own unique mix of products. There is also a popular book market by the Petrivka metro station. At the city's southern outskirts, near the historic Pyrohiv village, there is an outdoor museum, officially called the Museum of Folk Architecture and Life of Ukraine It has an area of 1.5 square kilometres. On this terrain, multiple "mini-villages" that represent the traditional countryside architecture of various regions of Ukraine are built. Kiev also has numerous game attractions like bowling, carts, paintball, billiards and even shooting from real weapons. General view of the Andriyivskyy Descent. The Kontraktova Square of the Podil raion. 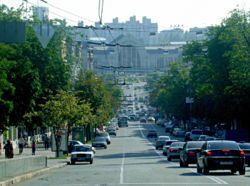 Khreschatyk, the largest and best known street in Kiev. Orange Revolution protesters gather at Maidan Nezalezhnosti. The Refectory of the Kiev Pechersk Lavra. The founders of Kiev, Kyi, Schek and Khoriv. The new Terminal to the Kiev Passenger Railway Station. Kiev, as the capital of Ukraine, has major administrative functions, with considerable status in the offices of the ministries responsible for the economy of Ukraine. Factories in Kiev are found in all parts of the city, with locations of major concentrations of industrial organizations located to the west of the city centre and on the left bank of the Dnieper River. The Kiev engineering plants, create their equipment based on metal from the iron and steel areas of Dnipropetrovshchyna and the Donbas coalfield. These plants in Kiev make equipment for chemical works, such as conveyor lines for vulcanized rubber, linoleum, fertilizer factories, and also metal-cutting machines. Other engineering products of Kiev area include aircraft (see: Antonov), hydraulic elevators, electrical instruments, armatures, river-and-sea crafts, motorcycles, and cinematography apparatuses. Another important sector is the chemical industry, which produces resin products, fertilizers, plastics, and chemical fibres, made at the Darnytsky Raion viscose plant on the left bank of Kiev. Lumber milling and the production of bricks and reinforced concrete items are another well developed industry. Consumer manufactured goods include cameras (see: Kiev-Arsenal (photo camera), thermos flasks, knitwear, footwear, a range of foodstuffs, and hand watches. Kiev is also a large publishing centre. Kiev is supplied by electricity primary from the Kiev Hydroelectric Station, completed in 1968, just upstream of the city at Vyshhorod, on the Kiev Reservoir, and from Trypillia thermal electric station. Nowadays, all but a few regions of Ukraine are interconnected by the Ukrainian electric power grid. Following the Chernobyl accident the Chernobyl Nuclear Power Plant located 100 km north of Kiev has been closed. Kiev also receives its power supply in the form of natural gas, piped from Dashava in western Ukraine. 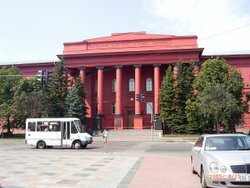 Kiev hosts many universities, the major ones being Kiev National Taras Shevchenko University, the National Technical University "Kiev Polytechnic Institute", and the Kyiv-Mohyla Academy. The total number of institutions of higher education in Kiev approaches 200, allowing young people to pursue almost any line of study. While education remains largely in the hands of the state, private institutions are on the rise. 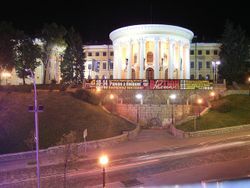 Among private, higher education institutions that are gaining popularity and reputation are the Kyiv International University and the European University. There are about 500 general secondary schools, evening schools for adults, and specialist technical schools. Some research establishments located throughout the city are headed by the Ukrainian Academy of Sciences, which also maintains the largest of the city's many libraries. Kiev is also noted for its medical and cybernetic research. Kiev is the traditional English name for the city, but the Ukrainianized version Kyiv is gaining usage. The earliest known English-language reference is to Kiovia, in English traveller Joseph Marshall's book Travels (London, 1772). The name Kiev was used in print as early as 1823 in the English travelogue New Russia: Journey from Riga to the Crimea by way of Kiev, by Mary Holderness. By 1883, the Oxford English Dictionary included Kiev in a quotation. This name was established on the basis of Russian orthography and pronunciation [ˈkijef], during a time when Kiev was a city in a governorate of the Russian Empire. Ukrainian was considered a language of the village, and attempts to introduce it as a literary language were suppressed (see Ems Ukaz). 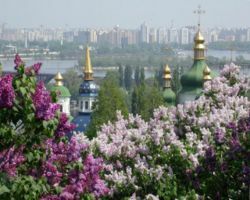 The spelling Kyiv, romanized version of the Ukrainian name for the city [ˈkɪjiw], has been used in English-language publications of the Ukrainian diaspora and in some academic publications concerning Ukraine during much of the twentieth century. Newly-independent Ukraine declared Ukrainian its official language after 1991, and introduced a national Latin-alphabet standard for geographic names in 1995, establishing the use of the spelling Kyiv in official documents since October 1995. The spelling is used by the United Nations, NATO, some foreign diplomatic missions and a number of media organizations, notably in Canada. The alternate romanizations Kyyiv (BGN/PCGN transliteration) and Kyjiv (scholarly) are also in use alongside Kiev in English-language atlases. Kyiv and Kiev reflect the divergence of the Ukrainian and Russian languages from the single Old East Slavic form *Kijevъ (spelled Києвъ or Кієвъ). According to the legendary account in the Primary Chronicle, the city is named after Kyi (Кий), who is said to have founded the city with his brothers Shchek and Khoryv, and their sister Lybid'. On October 3, 2006, the United States Federal Government changed its official spelling of the city name to Kyiv. Some proponents of the spelling Kyiv take exception with the use of Kiev as reflecting imposed Russification in Ukraine, and consider it inappropriate since the country's independence in 1991.